The Foundation was originally established as the Ciba-Geigy Science Promotion Foundation in September 1987. The name was changed to the NOVARTIS Foundation (Japan) for the Promotion of Science in 1998, and in 2012 the Foundation was placed under Cabinet Office authorization as a public interest incorporated foundation. The Ciba-Geigy (now Novartis) Group is committed not only to economic activity in the countries where it is active, but also to human welfare around the world. Consistent with this mission, in 1987 the company decided to provide JPY 1 billion to establish the Ciba-Geigy (now Novartis) Foundation in Japan. The goal was to promote the development of core technologies in the 21st Century by supporting creative research in the natural sciences, and thus to contribute to academic advances and the betterment of human welfare in Japan. Ciba-Geigy merged with Sandoz in 1996, leading to the formation of Novartis Pharmaceuticals in 1997. The Foundation received its current name in 1998, and received Cabinet Office authorization as a public interest incorporated foundation in April 2012. 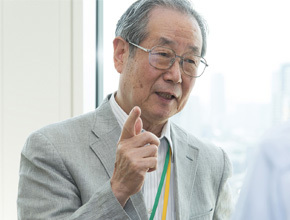 In the 29 years since it was established, the Foundation has supported creative research in the life sciences and related fields of chemistry, and has actively promoted participation in international conferences to promote the sharing of ideas between Japanese and overseas researchers. Even when such research does not lead directly to practical applications, it contributes to the body of new findings and theories, and that will open the door to future applications and developments, both in academic research and in industry. Up to this point a total of 1,700 projects and events have been supported, at a total outlay of JPY 2.0 billion. The NOVARTIS Foundation (Japan) for the Promotion of Science was established on September 4, 1987, for the purpose of contributing to academic development and thus improving public health and welfare by promoting creative research and international exchange in the field of life science and related chemistry. Since that time, the Foundation has granted nearly JPY 2.0 billion to approximately 1,700 research projects and international exchange activities. Although the funds provided by the Foundation may account for only a small part of the total research expenditures, it is our hope that these grants will help the research to proceed more smoothly. By defraying a portion of the cost of international conferences, the Foundation also actively supports international exchange by researchers. Many of our grantees have been published in high-impact international journals, and have sent us warm letters of gratitude and appreciation for the Foundation's support of their work. This, of course, is very encouraging to us. We look forward to continuing to support innovative Japanese research through a rigorous and unbiased selection process. Thank you to everyone involved with this program for your ongoing assistance and encouragement. Recently they say that the science and technology fields in Japan have made remarkable progress, and in some specific fields already outrun international standards. While there was criticism that few discoveries or inventions made in Japan has been based on ideas of Japanese origin, the past few years have witnessed a budding of much Japan-original research in the bio-science and new-material fields. These efforts will no doubt improve human welfare and life-style, not only by realizing the diagnosis, cure and prevention of cancer and other so-called incurable diseases, but also by protecting crops and the environment. It is not too much to say that the entire world is beginning to pay attention to Japan, a country which could become one of the leaders of the 21st century. In spite of the big potential foreseeable in Japan, all the essential conditions for becoming a true leader have not been satisfied here. For example, many academic authorities point out that the cultures that promote science and technology have not been consolidated well in Japan. While researchers should have insight, decisiveness and patience in order to achieve creation, they should be supported mentally as well as financially throughout the course of research implementation. Affiliation with international forums or exchange programs is also a key factor for success. It is thus hoped that these diversified conditions will continue to be offered from the point a bud blooms to when it becomes a real creation that contributes to human welfare. In Corporate Principles, the Ciba-Geigy (present Novartis) Group has made a commitment to contribute to the human welfare as well as economic welfare of the society in which it operates as a commercial company. Accordingly, the Ciba (present Novartis) Foundation was established in London in 1949, and the Friedrich Miescher Institute in Basle, Switzerland in 1970. Then in March 1987, the decision was made that 1 billion yen would be contributed for the promotion of creative research and the reinforcement of international exchange programs in Japan, and some additional annual support would be given for the maintenance of the Foundation. The Ciba-Geigy (present Novartis) Group is to implement this decision and will establish the Ciba-Geigy (present Novartis) Foundation (Japan) for the Promotion of Science under the authorisation of the Ministry of Education, Science and Culture, hoping that funding for natural sciences will promote the development of core technologies in the coming 21st century, and eventually contribute to the betterment of human welfare.